As you all know my recent trip to Bhutan exposed me to meditation on a much deeper level. I’ve been so inspired by the whole experience that I wanted to create my own space at home and I thought I would share it with all of you! I picked up a few meditation tools while I was in Bhutan but I’m sure you can get some similar things locally or off the internet. As i’ve said before the key to creating any type of ‘sanctuary’ is to have your own vision and make it personal to you – just be mindful that the point of this space is to help you cultivate inner peace and calm through the beauty of meditation. This is how I’ve created my space so please follow it just as a guide and add in whatever you think you might like to use to make this space your own. The Room: Choose a room with the right energy. I chose to put my meditation space in my office – even though this might seem like quite a stressful space I feel like the way its decorated is quite soothing and it works as a good reminder for me in the morning to practice meditation before I launch into work. It’s not the biggest space but I feel like I’ve made it cozy with my cushions and alter. Decorate your space: I have 2 mediation cushions (Zafu) and one meditation mat (zabuton) that I bought online, here. I’m really happy with both of them and they have lots of shapes and sizes on this site. I plan on buying or making a wall mural for this area but for the time being I have cards that I bought from Bhutan of Buddha and Guru Rinpoche. Alter: I created my alter from an old wicker basket/storage box and covered it with Bhutanese fabric. If you want to buy some Bhutanese fabric please contact my friend Wesel, here (she also sells amazing Bhutanese bags and purses). I have a singing bowl, a candle, some incense and some chimes. 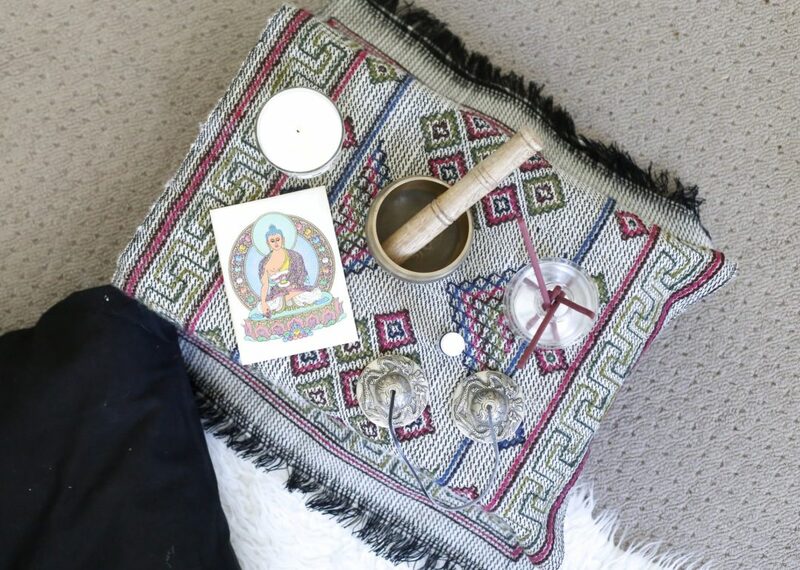 I picked up these things in Bhutan (apart from the candle) but I’m confident they are goods which you can easily get hold of online or in your local markets or shops. I feel like it’s really important to have an alter to display your sacred objects and to also help define your special place. Timer: I haven’t included a timer in my photos but I think it is important to include one in your space. This enables discipline in your practice and also means you can build on your practice by increasing the time slowly. I feel like having a timer gives you the opportunity to set this time aside, knowing that this is your time to meditate. You can find timers, here. Personalise. Make sure you personalise your space to your own taste. I went for monochrome as I find black and white soothing and clean in my headspace. I find bright colours quite distracting and not soothing but choose what works for you. You want to feel relaxed and be able to focus on your practice easily. Minimal: Try and keep your space free from clutter. Similarly to the above you want this space to bring about calm and peace. Nature: I added some flowers to my space to help bring the outdoors in. This is a good reminder to connect to nature and create balance and calm. It works as a gentle reminder to pay respect and gratitude to nature and your surroundings. Aroma: I have included Bhutanese incense sticks which I love but you could also include scented candles, aromatherapy oils a diffuser and so on.